With the fate of abortion rights bound to be central to the fight to replace Justice Kennedy, women on the right will be key messengers for the president's nominee. 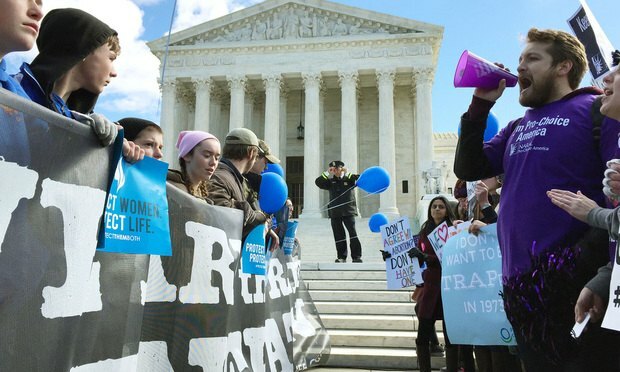 Demonstrators for and against abortion rights demonstrate outside the U.S. Supreme Court on the day of arguments in the “Whole Woman’s Health v. Hellerstedt” case on March 2, 2016. Photo by Diego M. Radzinschi/ALM. In the hours after U.S. Supreme Court Justice Anthony Kennedy announced his retirement, conservative groups immediately began to marshal pro-life women to talk about potential replacements in the context of overturning Roe v. Wade.